Dubai, UAE, 3 October, 2016: In supporting and furthering global efforts being undertaken during the International Breast Cancer Awareness Month (BCAM), Her Excellency Sheikha Lubna bint Khalid bin Sultan Al Qasimi, Founding Board Member of Friends for Cancer Patients (FoCP), has officially launched Zulekha Hospital's breast cancer screening and prevention campaign, ‘Pink It Now', aimed at advocating early detection and reduction of deaths from cancer across the UAE. Now in its fifth consecutive year, the ‘Pink It Now' campaign enjoys the goodwill and patronage of several international and local doctors, and was launched alongside prominent global cancer campaigners. The initiative comes in line with the UAE government's health goal of decreasing cancer fatalities by 18% within 2021, and is being undertaken in collaboration with The Pink Caravan, an FoCP initiative that has been functioning in the UAE since 2011 to raise awareness about breast cancer; highlighting the importance of early detection, regular check-ups, and dispelling the innumerable myths that surround this disease. 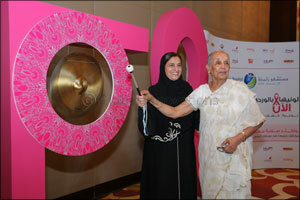 During the ‘Pink It Now' launch ceremony, HE Sheikha Lubna Al Qasimi, emphasised how empowering the public through awareness campaigns such as this make all the difference when it comes to disease prevention and the promotion of health – even more so in case of breast cancer, as early detection and timely treatment can reduce fatalities up to 98%. “I take this opportunity to thank Her Highness Sheikha Jawaher bint Muhammad AlQasimi, wife of His Highness Sheikh Dr Sultan bin Muhammad Al Qasimi, the Ruler of Sharjah; Founder and Royal Patron of FoCP, International Ambassador for the World Cancer Declaration of the Union for International Cancer Control (UICC), International Ambassador for Childhood Cancer for UICC and Patron of Global NCD Alliance Forum, for the pioneering role Her Highness' has played in spearheading Sharjah's and the UAE's ongoing battle against cancer and other NCDs,' Sheikha Lubna added. According to a WHO World Cancer Report, breast cancer has a substantially higher incidence than any other type of carcinoma. In 2012 alone the disease affected 25.2% of the world's female population, with 14.7% fatal cases. The UAE registered 568 incidences of the disease, a rate five times higher than those of cervical or colorectal cancer. The ‘Pink It Now' launch ceremony featured the presence of esteemed guests, including Martin Kelly, Deputy Principal Officer, US Consulate General Dubai; Mrs Neeta Bhushan, DCM, Embassy of India and Ms. Sue Nigoghossian from Ford Middle East & North Africa. “With Pink Caravan supporting ‘Pink It Now' campaign, we want to empower women with sound knowledge on breast cancer prevention and screening options as this disease is curable if detected and treated before it develops into its advanced stages,” BinKaram added. Dr Pamela Munster, renowned cancer expert from the University of California in San Francisco, United States and the campaign's chief ambassador since its inception, said: “Nearly 1.7 million new cases of breast cancer were diagnosed in 2012 and in the Middle East and North Africa alone breast cancer amounts to 30% of all cancer cases. The 2015 edition of ‘Pink It Now' saw 1,826 women taking advantage of free specialist oncologist and gynaecologist consultations and this year women in the UAE can again register for free tests at Zulekha Hospitals in Dubai and Sharjah from now until December 31. ‘Pink It Now,' supported by partners including Friends of Cancer Patients, Pink Caravan, Ford Warriors in Pink – Ford MENA, Nestle Fitness, Bhima Jewellers, Colors TV, radio channels HUM FM and CLUB FM, and Femina ME, is one of Zulekha Hospital's core CSR initiatives, stressing the importance of strategies for cancer prevention, early detection and management of patients with the disease. Previous Story : Medical Tourism Tops Agenda at 2nd Dubai Health Regulation and Medical Tourism Conference.